This sweet Barley and Candied Winter Melon Drink is the perfect antidote to hot summer days. Both barley and winter melon are said to have cooling properties. Finally the sultry days of summer are upon us, complete with high temperatures and humidity. The mercury is expected to climb to the nineties later this week. 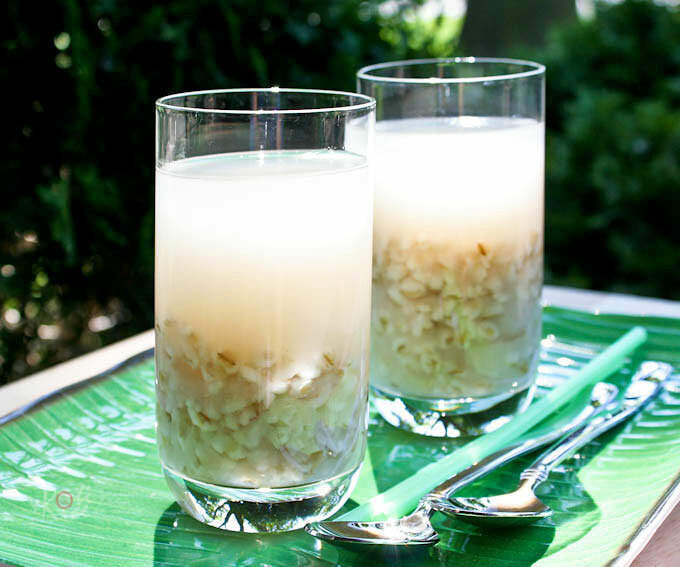 To combat the heat, this sweet Barley and Candied Winter Melon Drink is the perfect antidote. Both barley and dried winter melon are considered to have a cooling influence by the Chinese. Growing up in Malaysia, I had many, many cups of this cool and refreshing drink. While it may be served warm, I much prefer it chilled. Mom often made a huge pot of it and kept it chilled in jugs or bottles in the refrigerator. Fragrant pandan leaves, a Southeast Asian enhancement to the Chinese original, were included to give the drink added flavor. For people who prefer the drink without the barley grains and strips of winter melon, these may be strained out. Rinse and soak barley for 30 minutes. Drain. Place barley, candied winter melon, water, and pandan leaves in a large pot. Bring to a boil, reduce heat, and simmer for an hour. Remove and allow to cool. Serve warm or chilled. ** The candied winter melon itself is sufficiently sweet. Please add a little sugar if you prefer a sweeter drink. That’s not something you get often here – it’s been so hot, I could use this! I love this drink too. It can be served warm for winter too. I have never tried a bitter melon drink. Sounds interesting! This looks like gorgeous drink . 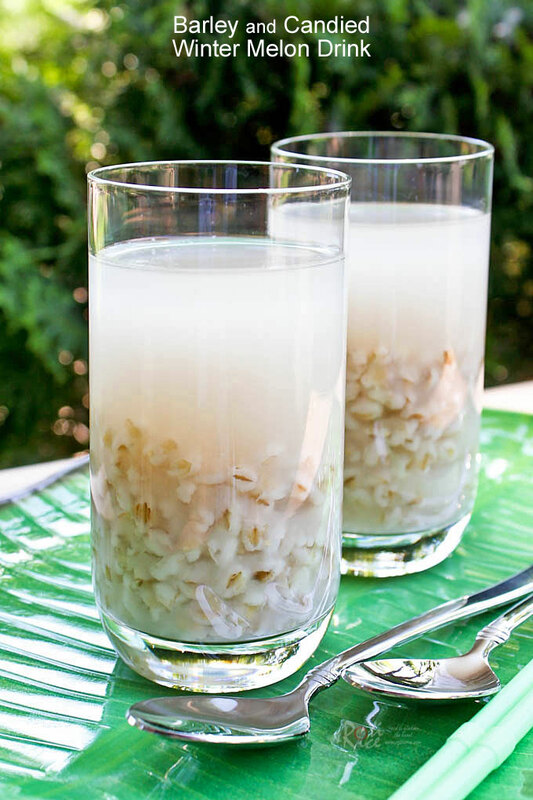 I love pearl barley ans use it profusely and this drink looks perfect for me. The winter melon candy looks like the Indian Petha , is it so ? Thks for bringing back the old charm! Biren, I love this barley and candied winter melon。We called 糖冬瓜意米水 in Cantonese but most of the time we only finished the barley water and candied winter melon…not to waste the cooked barley I will throw it into agar agar with egg drop as a sweet dessert. Yes, we call it that too in KL or the Hokkien equivalent. Your agar-agar with egg drop and barley sounds interesting. 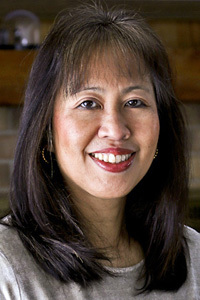 Is it on your blog? Thanks Ann! I will check it out soon. I love all your agar-agar creations. They are all so gorgeous and so good for the hot summer days. My mom loves to prepare a similar drink for us in summer time. So good to have a large glass after a nap in hot humid summer afternoon! I’ve never seen winter melon (does it have another name?) let alone a candied version. This looks very, very refreshing though. It is sometimes referred to as melon candy and some strips may have a slightly greenish color like that of honey dew melon. I bought this candied winter melon in Malaysia. Please refer to this post https://www.rotinrice.com/2010/05/sweet-barley-and-ginkgo-nut-soup/ for a picture of the ones that can be found here at the Asian grocery stores. This is very unique. I love barley but can’t quite imagine what this drink would taste like. It does look refreshing though and perfect for our hot summer day here. I’ve got an award for you on my blog today. This drink is sweet and most refreshing when chilled. This looks incredible. I’ve never seen anything like it. I have to try it. Thank you! We desperately need this cooling drink right now to combat the hot weather! We are still experiencing showers here in CA! I hope to get some sun here soon! Long time since I have drank barley with candied winter melon in it. I love munching those winter melon sweets. I never knew that they can be made into drinks. You are so lucky to have summery weather. The sun comes and goes where we are. Sad. Gosh, Biren. This looks so refreshingly different. I can just imagine how this hits the spot in that heat. Good luck in those rising temperatures! Cheers to you. This drink is new to me. I love finding out new and interesting things from you…I just wish I could grab it off the screen and try it! The temperature hit 100 degress today! Spring was so cool and then all of a sudden it is so HOT! Big swing in temps as it is suppose to cool down to the 60’s this weekend. Living in Phoenix, I am always game for a cool-you-off kind of drink. This one looks like nothing I’ve had before…in a good way 🙂 Definitely will be giving it a shot this summer…thank you!